Located at the No. 77 Di’anmenwai St. of Xicheng District, the Huo Shen Temple, or The Fire God Taoist Temple is a National-Level Cultural Relics Preservation Unit. 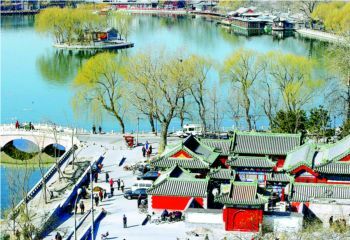 The architecture was possibly built in the Yuan Dynasty and was renovated once in 1605 (Ming Dynasty) and once 1759 (Qing Dynasty). The Beijing municipal and district governments has invested 10 million yuan to remedy the Temple, and special funds of 20 million yuan from the China Taoist Association enabled the relocation of sprawling dwellers and units. The remedy and relocation works not only rescued the Temple from dilapidation but also greatly improved the adjacent environment, creating a new pattern of cultural relic rehabilitation for the future.